CreepSquash is a simple web-based application that offers parents a non-invasive, safe and effective way to protect children and teenagers from the biggest dangers on Facebook – Bullying, Online Predators and Toxic friends. We offer Free 30-Day Trial for every parent and the most affordable value you can buy in a quality parental monitoring service. Membership is based on a low monthly rate that amounts to pennies a day. We take pride in offering the most in terms of value so that no parent is left behind. Parents are simply unable to be everywhere at all times. With more than 800 million active users on Facebook, there is still very little awareness and even less protection for our children online. We cannot shield our children from all the evils of the world, but we can take a stand as parents and get with the times. At Creepsquash, we foster Awareness, Protection and Prevention. We answer the call to duty that will keep millions of children and teenagers from slipping through the cracks. Our system is incredibly effective in a way that allows children to socialize and engage within a safe world online. Founder and CEO, Kevin Potter, came up with the idea for Creepsquash when his concern grew over his five children practically living on Facebook. He wanted to be a responsible parent and keep his children safe, but also let them have their freedom. In an effort to prevent his fears from becoming his worst nightmare, he worked with a team to develop a solution that would ease his worries as a parent, and extend the benefit of a safe Facebook community to parents and children everywhere. 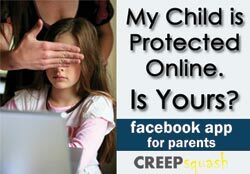 CreepSquash provides the most comprehensive monitoring solution for parents to keep kids safe on Facebook. 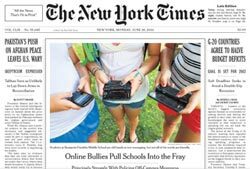 The innovative technology works from anywhere a child accesses the site, and Exclusive Features that combat online predators and help parents become aware so they can take action before it's too late. you have to be in their lives today."